According to Islamic insight and based on rational judgment, one should fully follow and obey his Creator and the Lord of universe; as human is not aware of hours or even minutes of his future life and needs Allah even in the most minor matters; but Allah, who has created him, knows the smallest secrets of existence of His own creation and also knows human’s final destination in his journey. Thus, the human intellect will lead him to his God; in addition, because in addition to what was mentioned He is absolutely independent and rich in all things and also He does not need His creations at all, so He wants nothing but good for human. But, according to Islam and Quran’s point of view, this obedience is not limited to Allah. According to the commandment of Allah, a Muslim should follow and comply with Holy Prophet (peace be upon him and his progeny) and the Infallible Imams (PBUT). According to this view, the absolute and unconditional adherence should only be to Allah and according to His command we must obey the Prophet and Infallible Imams in all things, as well. Their speech and behavior in all things, shows us clearly a way that leads human to please Allah and eternal happiness. Because their deeds and behaviors are devoid of any whims and they are innocent of any wrongdoing by the grace of Allah. According to Islamic teachings, one must not be an absolute and unconditional obedient to anything, except Allah and because of Him the Prophet and Infallible Imams. The initial source of obedience to Allah and the Infallible Ones is the human intellect (as mentioned before); But then, along with human rationality, it is the devotion to Lord that completes it. When human thinks a little more, he finds himself drowning in the sea of divine blessings and grace. He will understand that whatever he has, comes from Allah and despite the enormous ingratitude of man, not only He has not cut His kindness, but also it continues each and every moment. So, he tries so much to follow the path of obedience to such a merciful Lord, the path that does not lead to anything but perfection and happiness. The integrity and overall concept of Wilayat which is explained in Islam is nothing out of the obedience of Allah and the Infallible Ones. On the one hand the relationship between Muslims and Shiites with Prophet Muhammad and Fourteen Infallible Imams is bilateral and very deep. The first side of this relationship begins from Prophet and Imams. They had such kindness and compassion towards individual Muslims that the slightest discomfort and distress of a Muslim, will upset them (There are many evidences in Islamic texts.). On the other hand, Muslims love Fourteen Ones wholeheartedly because they know that moral virtues and spiritual perfection are gathered inside them. This deep relation causes such an adherence that Muslims not only are obedient toward words and behaviors of their guardians and Imams, but also do not feel even a slight concern about them in their mind. In the Holy Quran (which is the word of Allah and a revelation from Him), there are several evidences that prove the Wilayat position of Prophet Muhammad(peace be upon him and his progeny) and Imam Ali (PBUH) _first Imam_ by Allah. But other Imam’s Wilayat will be confirmed by Allah, according to the notification of Prophet. 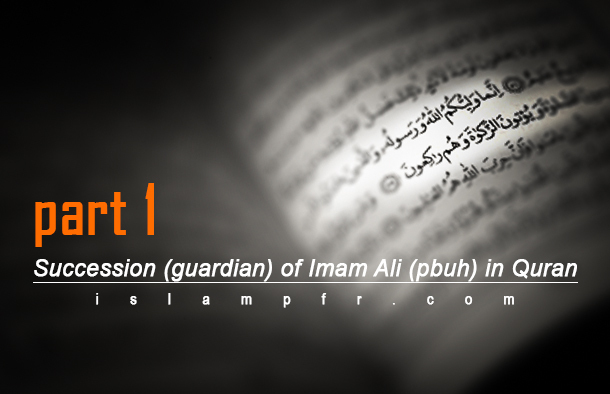 Now, we analyze carefully and reflect on one of the verses of the Holy Quran within which the issue of Wilayat has been mentioned and this position has been proven for Prophet and Imam Ali (PBUH) in addition to Allah. For this purpose, first we will discuss the words used in this verse separately, and then will mention the reason of verse revelation and at the end will pay more attention to different parts of the verse. This word is used to show restriction in Arabic; it means that the speaker restricts his intended purpose to special meaning and concept or to specific individuals, and also negates it of other concepts or entities. For example, if it is said that only Allah is the one who we worship, this means that divinity and being worshipped is solely for Allah and other creatures have been removed from the divinity degree. On this basis and in accordance with other laws related to the use of this word in Arabic (which is mentioned in explanation part) bringing «إنّما» at the beginning of this verse restricts Wilayat position of believers to some specific individuals. In Arabic, there are two types of sentences to express a concept. (One is called nominal and the other is called verbal) .verbal sentence is the sentence that begins with a verb and nominal sentence is the sentence that begins with a noun. Each one of the different types of sentence is comprised of bases and elements which complete the meaning of a sentence and if any one of them are removed, meaning remains incomplete. The speaker can use these elements in different parts of a sentence and change their arrangement according to his intended meaning. The standing person is Muhammad. In the first case, if «إنّما» comes at the beginning of the sentence, it will restrict “Muhammad” that comes at the end. It means that the standing person is only Muhammad (No one else). But if we use «إنّما» in the second case, “standing” that comes at the end will be restrict. It means that Muhammad is only standing (and does nothing else). Also in the verse in question, the last element mentioned in the sentence is introducing those people who are men’s guardians. So, according to what we mentioned earlier, «إنّما» restricts these ones and the verse says that your guardians are Allah, His Messenger, and the believers, those who perform the Salah, and give Zakah as they bow. In Arabic dictionaries such as “مفردات القرآن/Mufradat al-Quran” and “لسان العرب/Lisan al-Arab” and… many meanings are given to this word. For example, groom, confederate, friend, guardian, helper… . Many of these meanings had been mentioned in description of the word «ولیّ» can not imply a clear concept, not only in this verse, but also in other verses of Quran. «زکات» means “Giving money for the pleasure of Allah” and one way of it, is giving money to the poor people which is mentioned in this verse. Because the word “bowing” comes after mentioning the prayer by the believers (یقیمون الصلوة), bowing refers to the specific action in the prayer after reciting Al-Hamd and Al-Ikhlas Surah and means to bend and to curve the head. Bowing has three kinds of meaning including literal, idiomatic and figurative. Its literal meaning is bending and curving the head, if this is done with the intention of closeness to Allah and in prayer, it is considered as one of the actions during the prayer and is idiomatic meaning of Bowing. In other words, the idiomatic meaning of bowing roots in its literal meaning, the difference is that this is a main action in prayer and because of this, it must be done with the intention of closeness (the intention of closeness means all the attention should be directed to Allah and the action being done only to His satisfaction, not another thing. Its figurative meaning is humiliation and humility in front of one person. Always when we are reading a text, the literal meanings of the words comes to our minds at first and if there is a reason and indication, the idiomatic and figurative meanings will be considered, too. Similarly, we should consider the literal meaning in Quran and if there is indication and reason, we can refer to their idiomatic and figurative meanings. Also bowing is not exempt from this rule and wherever we came across this word in the Quran, literal meaning should be considered first. For example, if a verse talks about prayer and prayers, we should use idiomatic meaning inevitably and if there are other evidences, we will refer to figurative meaning. Also, in this verse we should use the idiomatic meaning of bowing (means one of the specific actions) because at the beginning of the verse we read about performing prayer (یقیمون الصلوة). At the beginning of this discussion we mentioned that the word «ولیّ» is discussed by commentators in three meaning: friend, helper and guardian. We analyze the first two meanings (friend and helper) and then deal with the third meaning to find the best meaning of «ولیّ». Your friends or helper is only Allah, His Messenger, and the believers those who perform the Salah, and give Zakah as they bow. As we said «انّما» is used for restriction. So, according to «انّما» and the two meanings, friend or helper, we conclude that only Allah, His Messenger, and the believers, those who perform the Salah, and give Zakah as they bow are our friends and helpers. Given this meaning we should have no other friend and helper and we cannot address anyone else (who did not give Zakah during bowing) as friend or helper. This verse indicates that to assist and to help is not just for certain people and it is said whoever asks your help for the sake of religion, help him. Also, in this verse helping each other is based on righteousness and piety and is not restricted to specific individuals. Allah the Almighty has called the believers as brothers of each other, while it is clear that the Islamic brotherhood is superior to the friendship (or helping each other). So how is it possible that we can only select our friends from those who give Zakah during bowing and only ask them for help while Quran has introduced the believers as brothers? So, it becomes clear that the meaning of «ولیّ» cannot be friend or helper in this verse. Because the meaning of friend and helper are general and are not restricted to specific ones.